A New York City police officer accused in the death of a black man while attempting an arrest will face a disciplinary trial in May, an administrative judge said Thursday. Daniel Pantaleo has been on desk duty since Eric Garner’s July 2014 death on Staten Island. He appears on a cellphone video appearing to use a type of chokehold that is banned under NYPD policy. Garner’s pleas of “I can’t breathe” became a rallying cry for the Black Lives Matter movement. Pantaleo’s lawyer, Stuart London, said the officer used a takedown move taught by the police department, not a banned chokehold, and will be vindicated. After a brief hearing, his union issued a statement blaming the 350-pound Garner’s poor health and resisting arrest for his death. 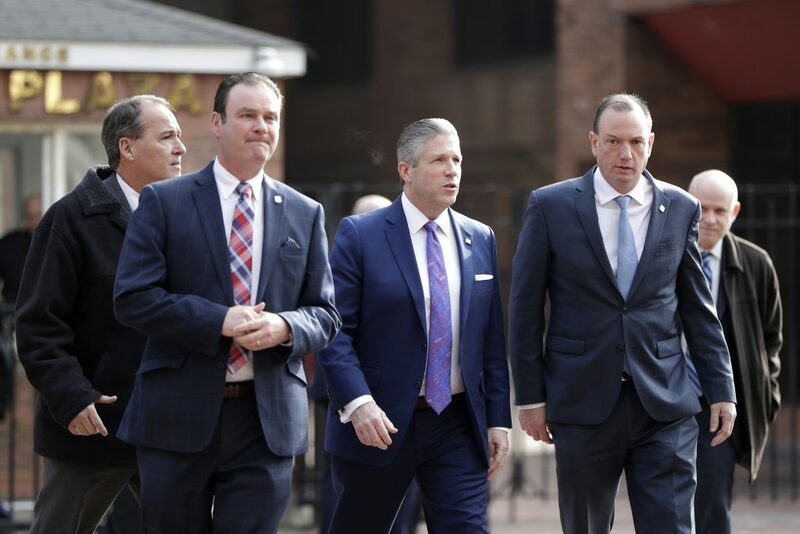 Pantaleo’s union, the Patrolmen’s Benevolent Association, said Thursday that Pantaleo had used “the least amount of force necessary” and that Garner’s autopsy showed that his windpipe, which could’ve been crushed by a chokehold, was intact. “This case demonstrates the danger that is inherent in prejudging incidents absent all of the information that must be considered in order to come to a truthful and accurate conclusion,” union president Patrick Lynch said in a statement. A watchdog agency called the Civilian Complaint Review Board is prosecuting Pantaleo, who says he expects to be vindicated.